Early morning drive from Kampala City / Entebbe airport to the most diverse game park in Africa in terms of wildlife. Located in western Uganda, a drive is made cross the "Equator" and through numerous developing African towns. 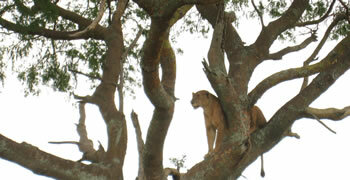 The park offers over 100 species of mammal and 600 species of birds. Entering the park through Kantunguru gate gives us an eye opener to the wildlife of the park. 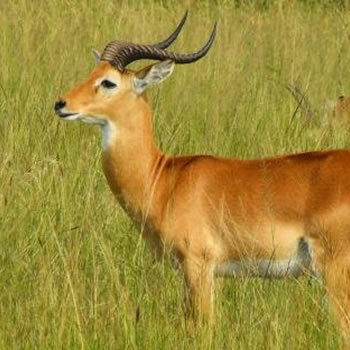 Animals like Waterbucks, Giant forest hogs, bush bucks and many others can be seen along the 20metre stretch to Mweya peninsular where the information centre is located. Accommodation in this park goes from low cost, mid range and luxury. Early morning game drive on the tracks of Kasenyi section of the park in search for the lions, Elephants, Buffaloes, the numerous Uganda Kobs as they graze and at the same time cautious of the lion attacks. During the drive a lot of bird life is experienced like the raptors, vultures as they all wait to scavenge on the "leftovers" by the lion. Afternoon boat cruise on the Kazinga channel - the haven for water birds in Uganda including the migrants from Europe e.g. Gulls, Terns, Storks. View them as they freely share territory with big game like elephants, hippos, Cape buffaloes. Crocodiles are also not strangers on the channel. Watch them as they sun bath on channel banks. Accommodation in this park ranges from low cost, mid-range to luxury. A drive back to Kampala / Entebbe is rewarding as we get good views of the "Mountains of the Moons" the Rwenzoris driving through Kasese and Fort portal towns.